The appropriate length of the growing light and the top of the plant is about 20-45cm (7.8-17.7inch), 5-8 hours per day. You can shorten or extend the time in accordance with plants growing. Please do not touch or knock the growing lamp body during working. Please water you plants more than usual when you use the LED grow lights. This plant grow light is aimed to promote the growth of plants not completely replace the sunshine, There are many other factors play roles in plant growth. Do not leave on all day or use plant lights more than 5 hours during the night. 24-hour use will harm your plants. Plants need time to rest. Gives off targeted wavelengths (460nm and 660nm). Accelerate the growth of indoor plants, foliage plants, flowering plants, succulent plants, potted plants, rapidly promoting leaves and flowers blooming. Achieve 360°coverage of plants with our three flexible gooseneck heads that covers a larger area than others. The LED grow lights have average lifespan of more than 30,000 hours. It uses far less energy and emits much less heat than fluorescent lamps. Our grow light is suitable for all stages of plant growth, flowering and fruiting. Its relative compact size makes it an excellent choice for cloning and seedling lights since they can be placed in tight spaces without worrying about heat increased. 【Double Plant-growth LED Beads Beneficial for Plants Fruits & Veggies】 ZUCKEO LED Grow Lights use double LED Plant-growth Beads-which means our lamp more effective and productive for plants,fruits and veggies. 【Uplate Triple Heads & Switches Design】Three separate switches control three LED plant grow lights, making them possible to work simultaneously or solely for one or two plants. Three luminous level choices are available according to the actual needs of plants. 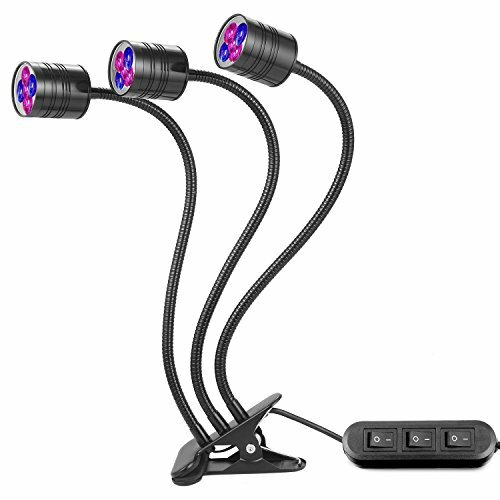 【Flexible gooseneck & Placement Ways】360°Adjustable gooseneck allows you to place the plant light in any direction to provide the best lighting angle for your plants. The clamp design offers 3 installation ways including stand,clip and hanging. 【Adorable Look,Good Touch & Long Life】ZUCKEO plant grow light is made of aluminum metal painted with good touch environmental oil casing, which guarantees good heat dissipation while the product is working. Lower power consumption offers longer service life up to 35,000 hours. If you have any questions about this product by ZUCKEO, contact us by completing and submitting the form below. If you are looking for a specif part number, please include it with your message. 50W LED Grow Lights Bulb, Osunby UFO 250 LEDs Indoor Plants Light Full Spectrum with Red Blue UV IR White for Seedling, Vegetative and Flowering.